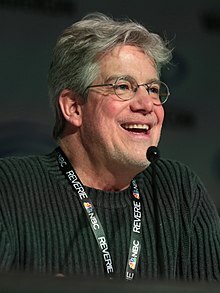 Townsend Putnam Coleman III (born 28 May 1954) is an American voice actor who performed in many animated series and TV commercials beginning in the early 1980s. Among his most notable roles are Michaelangelo from Teenage Mutant Ninja Turtles, Wayne Gretzky on ProStars and the title characters in Where's Waldo? and the eponymous The Tick. ↑ "Townsend Coleman Interview" Kidzworld.com. Retrieved on June 19, 2009. ↑ "The Tales of Hercules". Hulk and the Agents of S.M.A.S.H.. Disney XD. March 15, 2015. No. 16, season 2. This page was last changed on 10 September 2018, at 13:35.